There are no major economic reports in Japan today but New Home Sales and FOMC Economic Projections will be released today in the US. 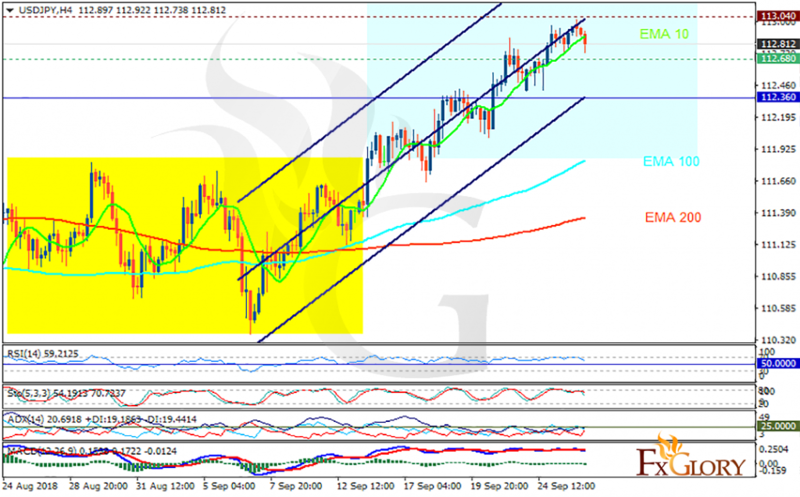 The support rests at 112.680 with resistance at 113.040 which both lines are above the weekly pivot point at 112.360. The EMA of 10 is moving with bullish bias in the ascendant channel and it is above the EMA of 100 and the EMA of 200. The RSI is moving in overbought area, the Stochastic is showing downward momentum and the MACD line is below the signal line in the negative territory. The ADX is not showing any clear signals. While there might be pullbacks on the way, USDJPY may grow towards 114.